YouTube has revolutionised the way we consume content. Gone are the days when television and books were our only sources of entertainment. Now we can spend hours watching videos on YouTube, from music videos to home movies to the ever popular cat videos. This shift towards the consumption of more internet-based content is particularly prevalent among the younger generations who are completely changing how brands market their products to these target audiences. 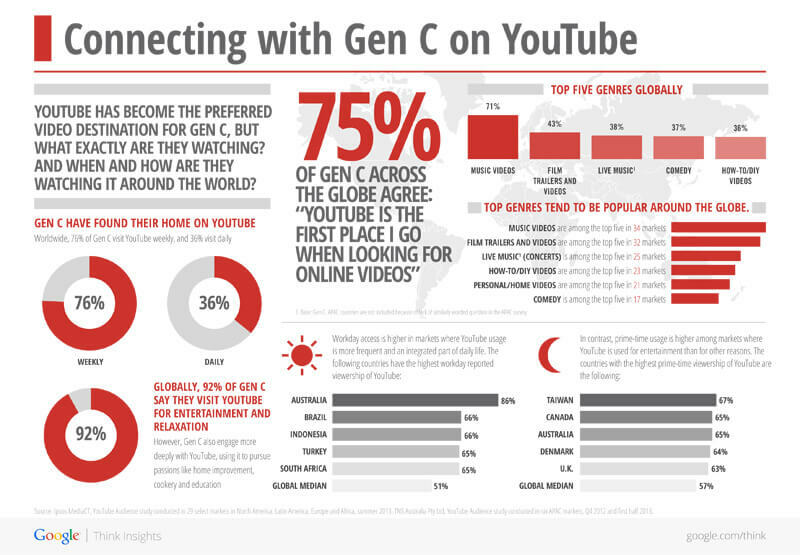 The ever-increasing popularity of YouTube among 18-34 year olds has led to a whole new generation, Generation C. Gen C thrives on connection, community, creation and curation and make purposeful decisions about how they choose to live their lives. Generation C seamlessly integrate technology into their everyday lives and are constantly connected. They are constantly consuming online content, on desktops and on mobiles. Generation C connect and engage with a number of different communities, including family & friends as well as with virtual communities with similar hobbies and interests. 55% of Generation C are connected to 100 or more people through social media sites. Generation C are a dab-hand at creation but will only post when they feel that it is relevant to do so and that their post will make an impact. Generation C actively seek out ‘shareworthy’ content which they can then use to promote a reaction or reinforce relationships within their communities. You may be asking what Generation C could have to offer you? Well, they are up to 3.6 times more likely to buy products and services with greater regularity and 2 in 3 Generation C consumers say that if they found a brand they love then they would tell everyone about it. So building a relationship with these customers could be one of the best decisions your brand could make. Generation C types can be a brand’s best and most valuable customers. Although these customers can be hard to reach, they are a huge opportunity for brands if they take the time to really understand them. Build a relationship with them and they will actively advocate your brand, recommending you to their friends (both online and offline). Many brands don’t even know that this user-generated content surrounding their brand exists. Those brands that are on the ball tap into this type of content, and they actively encourage it by building relationships with their biggest advocates. Word of mouth can be the most effective and powerful form of advertising for your brand. Be part of the conversation. It can be so easy to set up a YouTube channel and post some basic videos that there really is no reason why you shouldn’t be. It is a powerful tool that, if utilised properly, can be a vital part of your content creation strategy. It also allows you to provide your customers and fans with a different type of content, and allows them to become much more engaged with your brand. Regularly updating your YouTube channel with videos will also be fantastic for your brand’s SEO strategy, as it is a great way to frequently update your site with fresh and relevant content. YouTube videos will also give your brand something interesting to share on social media, thus could radically improve your social strategy and performance. Experiment. Believe it or not, YouTube is still in its early days. This means that you have the opportunity to really experiment with your videos and try new things and ideas. You could try creating different types of video and see which one works best – what type of video best engages your customers and gets the conversation started? Be creative. One of the charms of YouTube is that viewers will watch exactly what they want to watch and can easily skip any videos that don’t grab their interest. Use this as an opportunity to get creative. Think about what type of videos your fans will want to watch and how you can best engage them. Be unique. This follows on from the creativity element of being on YouTube, ensure that your content is fresh and unique. No one wants their written content to be copied and for someone else to then get the credit for their hard work. The same goes for YouTube content. Be active on social media. Social media is a great way for you to promote your YouTube videos and engage your customers. Use it to your advantage and spread the word. Listen to your viewers. Stay on top of what type of video your viewers are watching and utilise this information by creating your videos around this. If your viewers regularly watch a certain type of video, and regularly engage with it, then cater for this demand and create videos based on this. Are you using YouTube? We’d love to hear your experiences, both positive and negative. Join the discussion by leaving a comment below.